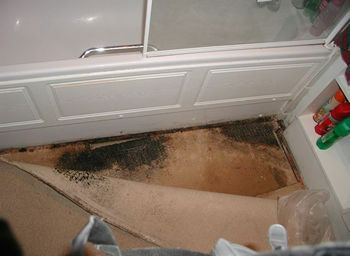 Mould growth can occur in carpet and underlay in both bathrooms and showers with inadequate ventilation. This results in moisture-laden air pulsing into adjacent areas and provides the conditions for condensation, mould growth and damage to finishes. Despite the best efforts of the ‘damp-proofing industry’ and the proliferation of ‘waterproof’ products in the second-half of the 20th century, it is not possible to keep water out of buildings. Our grandfathers knew this and relied instead on drainage details and breathable materials, so as to allow any water entering the structure to dissipate. Failure to maintain these systems or the inappropriate introduction of ‘waterproof’ materials or ‘damp-proofing systems’ will result in the build-up of moisture and damp problems in both historic and new buildings. This is well illustrated by considering the phenomena of condensation in buildings. Strictly speaking, ‘condensation’ describes the physical process by which substances change from a gas or a vapour to a liquid phase, usually as a result of a drop in temperature. However, the term is commonly used to describe the process when moisture in the air condenses out to form liquid water as fine droplets in the air, or on a relatively colder material. Common examples of the former in the natural environment are the formation of clouds when warmer moisture-laden air mixes with colder air above, and fog, where this occurs at ground level. Similarly mist forms when warm moisture laden air is cooled by heat loss over night. Examples of the latter include the misting up of car windows when the warm moisture-laden air within cools on the surface of the window screen, and the misting on the surface of a mirror when held in the moist air exhaled from the mouth. This occurs because reducing the temperature of the gases that make up air reduces the energy available to keep the molecules whizzing around randomly within the available space, and lets a proportion of the molecules settle down into a less mobile liquid phase, in which the motion is more limited. Conversely, molecules in the liquid phase may pick-up enough energy to leave the liquid and ‘evaporate’ off to join the other gas molecules randomly moving around the available space once more. In fact, at any time molecules will be ‘condensing’ and ‘evaporating’ from any liquid water. The more active and energetic the molecules are, the greater ‘pressure’ they exert. This is described as ‘partial vapour pressure’. If the energy and hence the partial vapour pressure of the molecule in the liquid is higher than those in the air, then there will be a net movement of water into the air resulting from net evaporation or drying. Conversely, if the temperature and hence partial vapour pressure of the water molecules in the air is higher than that in the liquid or other adjacent material, there will be net condensation. 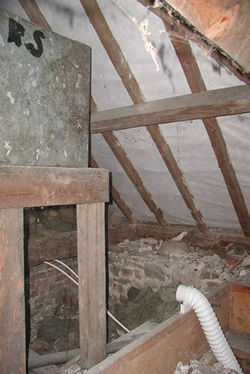 An exhaust duct from an extractor fan in a shower unit installed in an 18th century country house, is shown discharging into the roof void and providing the conditions for condensation, mould growth and insect decay in roof timbers. It also shows an uninsulated cold water tank which resulted in cold bridge condensation of moisture laden air. At any given temperature and pressure there is a limit to the amount of water molecules that a given volume of air can hold. From the above it will be appreciated that this will rise and fall with the temperature. When a given volume of air contains the maximum amount of water possible at any given temperature it is described as ‘saturated’, and the moisture content of air at any given temperature is often described as a percentage of the maximum amount of water it could hold if saturated at that temperature. This is the ‘relative humidity’ (RH) percentage. Conversely, it will be appreciated for any given amount of moisture in a given volume of air, there will be a temperature at which the air would be ‘saturated’ and that any further drop in temperature could result in net condensation. This is called the ‘dew point’ temperature. Although the relative humidity of air is often measured and discussed, it will be appreciated from the above that it is not really a useful figure unless the temperature is also considered. Because the factors affecting condensation are so complex, specialists concerned with moisture movement will refer to tables or psychrometric charts’ to determine the relationship between the moisture content of air, the temperature, the partial vapour pressure, the dew point and the specific ‘enthalpy’ – the latter may be considered as representing the energy available within the system. This can all seem very confusing even for specialists with a scientific background. However, when considering moisture movement and condensation in buildings, there are a few simple rules of thumb that are adequate for most practical purposes. Firstly, moisture can generally be thought of as moving from relatively wet to relatively dry areas or structures, and from relatively warm to relatively cold areas in buildings. Secondly, it is generally only necessary to determine and consider the dew point of the air, and the probable temperature of the fabric, in order to identify where condensation may occur. It should also be remembered that this is a dynamic process with continuous fluctuations in the temperatures and moisture content of air as a result of annual and diurnal changes, as well as the result of local heating and ventilation. Because of these factors it would be necessary to measure the temperature and moisture content of air over time and in a large number of representative locations to determine if net condensation was occurring. This is why the common practice of referring to individual RH percentage readings is often confusing and counter-productive; and why in most cases it is better to focus on possible moisture sources, and to look for evidence of moisture accumulating in vulnerable materials or on vulnerable surfaces, when investigating possible condensation-related problems. This mould growth on contaminated wallpaper represents a potential environmental health hazard to those occupying the building. At the Monument in the City of London we see corrosion of railings and spalling of the staircase and spiral stair, due to water draining down the inside of the tower and staircase as a result of warm front condensation. 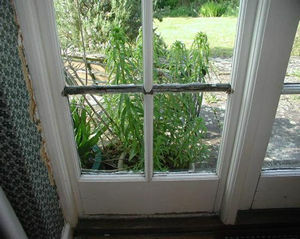 Decay to window frame is evident from condensation on the glazed surface, resulting in water penetration to timber elements which are prevented from drying due to the application of relatively impermeable gloss paint finishes. This had resulted in wet rot decay to the timbers. Original breathable paint finishes had previously allowed drying, preventing decay in the past. The air in occupied buildings will always contain moisture. This is because we are all mostly made up of water, and add water to the environment at every breath. Occupancy will also introduce water into the built environment with activities such as bathing, washing and cooking. In modern and refurbished buildings the installation of shower units, Jacuzzis, swimming pools and saunas in particular can add significant quantities of water to the internal air. Moisture will also enter the air within structures due to the evaporation of water penetrating from the exterior. This occurs mostly from ground and surface drainage via the foundations, and through walls and roofs due to defective roof drainage. Moisture-laden air may also enter the structure from the exterior when it is warm and wet outside relative to the interior environment. Any sources of moisture into the internal environment may result in moisture-laden air being cooled to below its dew point at relatively cool surfaces or within relatively cool materials within the building structures; resulting in net condensation and the accumulation of liquid water causing localised damp conditions. This localised accumulation of moisture as a result of condensation can result in a number of damp-related problems in buildings, including the decay or damage of building materials or contents, and affecting the health and comfort of occupants. Cold-bridge condensation occurs when relatively warm moisture laden air comes into contact with surfaces, at or below its dew point, which are relatively cold as a result of locally reduced insulation values between the warm air and a relatively cold area. Typical examples of this process are condensation at the base of external walls, where it may be confused with rising damp, condensation on window panes where it often results in accelerated decay to the lower parts of window frames, and condensation to the undersides of roof surfaces. The latter may result in accelerated corrosion of lead roof surfaces. Liquid water penetration into structures will usually degrade their insulating properties and may therefore form a ‘cold bridge‘, resulting in further condensation. Because of this it is not unusual to find water penetration at the base of walls or through roofs also causing local condensation. Cold bridge condensation can also occur on relatively cold internal structures, such as inadequately insulated cold water tanks or refrigeration units. Warm front condensation occurs when relatively warm moisture-laden air from the exterior enters into a relatively cold building, following a change in weather from cold to warm. 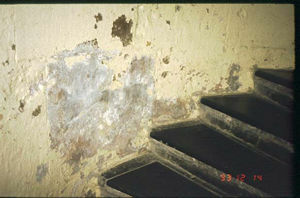 This usually occurs in the UK with a ‘warm front’ arriving from the Atlantic from November through to February, and can result in water running down the interior walls of massive masonry structures under reduced occupancy, especially in the towers of churches or castles, and in subterranean structures. Interstitial condensation occurs when relatively warm moisture-laden air diffuses into a vapour-permeable material or structure such as fibrous insulation or a porous brick wall. If it is relatively warm on one side and below the dew point temperature on the other; this can result in the moisture-laden air reaching ‘dew point’ within the material and depositing liquid water at this point. This becomes a particular problem if the diffusion of the moisture vapour through the material is restricted towards the cold side of the structure and if the insulation or thermal conductivity of the structure is such that the temperature profile is skewed towards the relatively warm side. The risk of condensation in these circumstances can be calculated using graphs and formulae, or using specialist computer programmes, and it can become a particular problem in heavily insulated or air-conditioned buildings. This is especially important when dealing with the conservation of buildings in extreme environments such as the conservation of buildings in the tropics, which tend to be airconditioned on refurbishment. In this situation, interstitial condensation can be a significant problem; and it is necessary to turn the usual calculations back to front, as conditions will be warm and wet on the outside and cold and dry on the inside of the structure. Similarly, extreme conditions can occur in very cold environments, and when refrigeration units are introduced, without adequate ‘vapour checks’ or insulation. Historically these problems have been controlled by ensuring that moisture laden air can exit to the exterior, and by controlling the effect of fluctuating air temperature by a continuous low level of structural heating. For example, historically buildings had relatively gappy structures and through ventilation was ensured, particularly in cellars and roof voids. Buildings were also ventilated by the passive stack effect via chimneys and staircases. Historically materials used in buildings such as thatch, lime plaster and traditional paints, were microporous or permeable allowing the movement of moisture vapour and drying. Low level structural and radiant heating was also provided in the past by the use of fires or stoves situated in massive chimney breasts and walls, or lately by the installation of massive hot water low level central heating systems, or in classical times by the hypocaust. More recently in new buildings reliance has been placed on insulation and ‘vapour barriers’. Unfortunately, these are generally imperfect, especially when retrofitted to existing structures, resulting in localised cold bridging or interstitial condensation. From the above it will be noted that the key factors in controlling condensation are ventilation, heating and insulation. These are the factors that usually require modification when dealing with an apparent problem with condensation in an existing building, often because they have been compromised by a previous refurbishment or change in occupancy. the inadequate provision of low level structural heating to massive structures under reduced occupancy, such as churches or castles, allowing cold front condensation. the introduction of defective insulation and ‘vapour barriers’ or ‘vapour checks’; especially in extremely hot or cold environments, or around cold structures within buildings, such as cold water tanks or refrigeration systems. This sensor probe is designed to monitor temperature and moisture profiles through a wall to identify and resolve problems of interstitial condensation as part of an H+R Curator building monitoring system. From the above it can be seen that in most cases the appropriate remedial measures to control condensation are often directly related to correcting defects previously introduced. This should be done as far as possible by putting the building back to the way it was originally designed, with the use of original materials and detailing. This is not always possible given the changes in use and modern styles of occupancy. However, in nearly all cases problems can be reduced by reference to the recommendations for new buildings found in Building Regulations and the associated British Standards. These are especially useful in specifying remedial works and in providing ‘comfort’ to organisations such as building guarantors, mortgage lenders and official bodies such as Building Control. In these circumstances it is often cost effective to seek advise from an independent specialist. As the temperature of moisture-laden air approaches dew point and the relative humidity rises, a number of moisture associated problems can become apparent, even before condensation occurs. In particular, superficial and interstitial mould growth can occur, especially on surfaces or in materials contaminated by dust or other organic materials. This typically occurs in poorly ventilated areas such as behind furniture and pictures, behind the glazing of pictures, in soft furnishings or carpets, and in poorly ventilated cupboards or corners of rooms, both at ceiling and floor level. This can cause serious damage to decorative and historically important finishes, as well as representing a significant health hazard, especially to sensitive individuals. 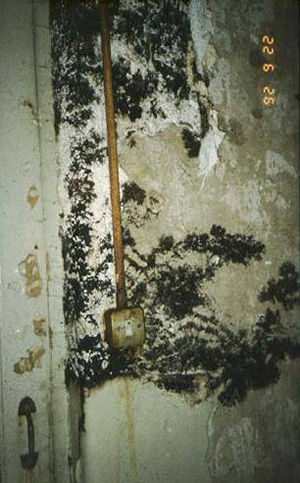 Interstitial mould growth in contaminated carpets, soft furnishings or insulation materials due to this raised moisture content and poor ventilation is a particular health hazard, and appropriate respiratory protection should be used in affected areas. Hygroscopic salts can also cause significant damage as moisture from the air is absorbed and evaporated from affected plaster, masonry or brickwork, with fluctuating temperature and air moisture contents above dew point. This can cause damage to decorative stonework and plaster finishes, even at relative humidities fluctuating around 75 per cent or less. Although these problems are not caused by condensation, in the way the term is usually used; they can be understood and managed using methodologies similar to those discussed above. In recent years it has become more common to try and control condensation in buildings using dehumidifiers. These may be useful in unoccupied buildings where environmental control can be achieved, such as in storerooms or museums, where it is the contents rather than the structure that is thought to be at risk. However, the use of dehumidifiers in occupied historic buildings is rarely cost-effective. This is because of the difficulty of effectively controlling air movement, and the high management and maintenance input required to ensure the efficient operation of the dehumidifiers themselves. It is common to find dehumidifiers installed in such circumstances vainly trying to dehumidify the entire external environment of the United Kingdom, or merrily extracting water from the air which is then allowed to recycle into the environment that is being attempted to be controlled. Efficient and cost effective use of dehumidifiers requires a high level of technical input, long-term monitoring and control. This usually requires independent specialist specification and supervision. Where possible it is therefore generally better to rely on the ‘fail safe’ and buffered systems inherent in the natural ventilation and structural heating of historic buildings. In conclusion, historic buildings with their original materials and detailing should not generally suffer from problems resulting from condensation. Where there have been changes in occupancy, and where new materials or new extensions have been added, problems resulting from condensation can usually be easily and cost-effectively controlled by an understanding of the control mechanisms inherent in the original structure. Remedial measures are then generally associated with passive ventilation and structural heating systems. Where new materials or structures are introduced or problems persist, the information contained in Building Regulations and British Standards can be used to solve most problems. In these cases an holistic investigation of the building structure, materials and occupancy should be carried out, and short- or long-term monitoring may be required to ensure that the most cost-effective remedial measures are undertaken. This will ensure the conservation of the maximum amount of original materials and detailing. TIM HUTTON is a building pathologist and environmental scientist, and the managing director of Hutton + Rostron Environmental Investigations Limited.